Worldwide competent advice, but at the same time personal, direct and binding - this is what our sales team stands for. This app contains a calculator with two valuable functions intended for people working in international steel business with different currencies, calculating steel coils and bars. 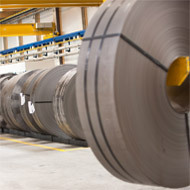 voestalpine Precision Strip is a manufacturer of cold-rolled strip steel meeting the highest quality standards available. With our production and distributions companies in Austria, Sweden and the United States as well as our sales subsidiaries in the United States, China, Spain and Mexico we employ around 1200 staff members and export our products for over 270 Mio € to over 80 countries worldwide.